Lancaster Grace is celebrating 50 years of God’s grace in Lancaster County, Pennsylvania, with a big homecoming celebration on Sunday, April 25. It all started in 1960 with a small group meeting in the Lancaster Poultry Center with their new pastor and wife Bill and Carol Tweeddale. From that small beginning, the Lord has blessed and impacted many lives through these past fifty years. One special way the Lord has used this body of believers is to start other churches around the area: Manheim in 1962, Elizabethtown in 1965, New Holland in 1966, Wrightsville in 1969, Lititz in 1971, Willow Valley in 1976, and Ephrata in 1980. The Lord has also used this body to call and equip many others who have gone out into career ministries to serve the Lord. They have been pastored through the years by Bill Tweeddale, Art Malles, Vernon Harris, Wes Haller, Bill Davis, Jonathan Tompkins, and current pastor Galen Wiley. We would love to have as many people as possible who have been impacted by the ministry of Lancaster Grace to join us for our celebration on Sunday, April 25. Lord willing, Bill Tweeddale, Bill Davis, and Jonathan Tompkins will be joining Galen Wiley in sharing in both the 9:30-11:30 Worship Celebration and also the 2:00-3:30 Homecoming Celebration. It is also exciting that Lester Pifer will be present in the morning, as he and the Grace Brethren Home Missions Council played such a key role in the Lancaster story. 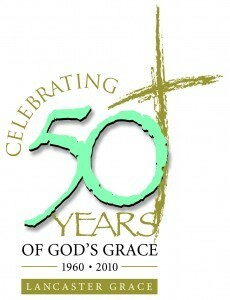 We will be celebrating God’s grace and sharing memories of God’s blessings over these past fifty years. If you have pictures or stories to share, please contact us in advance so we can have them on display (911 Rohrerstown Road; Lancaster, PA 17601; or lancastergrace@fgbc.org or call at 717-397-9991). Pastor Galen and Elsie Wiley and the present family of Lancaster Grace extend a personal invitation for you to join us in this special celebration. This year is also a time we are praying that the Lord would lead us to recommit ourselves to be the people He can use to reach many people in this generation and future generations until Jesus returns. We are planning on Saturday, July 3, to have a Community Festival with the help of an Operation Barnabas team. And we are also planning this fall to have a time of recommitment for the next fifty years and beyond until the Lord returns. The Lord has gathered together here at Lancaster Grace a unique group of believers, some who have been refined and matured through many years of walking with the Lord and others who are just discovering what it means to be followers of Jesus. One unique story of God’s grace has been how that Pastor John Smith and the congregation at Willow Valley GBC came alongside this congregation in 2004 to assist us in so many ways to become again a healthy people whom the Lord can use powerfully for generations to come. One of the greatest ways they have blessed us has been by sending us three godly families who have become the core of so much of what the Lord is doing here. So join us as we celebrate these past 50 years of God’s grace and as we dream together again of the next 50 years and beyond of God’s continued grace for His glory! !